Just have to take a photo of these stuff when I got them. 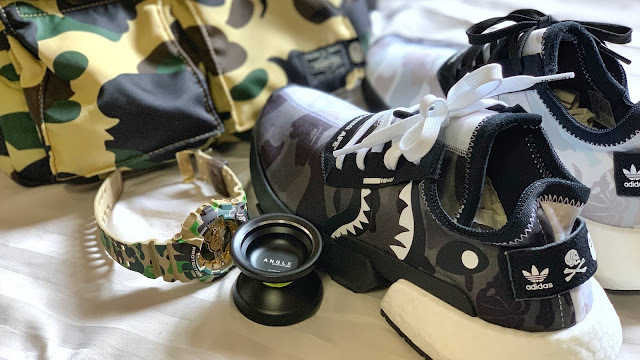 Everything in this 2 pictures consist of my favourite things, Bape and yo-yo. Especially Bape in yellow camos. 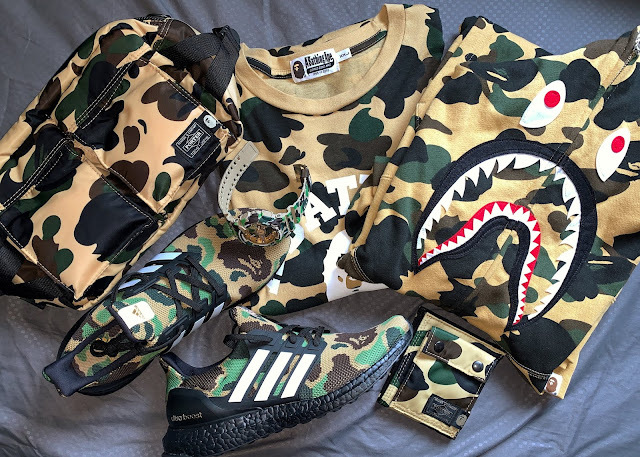 I was pretty happy I manage to get the Bape Ultra Boost, the Ultra Boost is one of my favourite sneakers and having it in Bape camo is definitely a must-have for me. I can't express enough how much I like Bape camos. Another thing from Bape that I really really like is their shark designed product, not all of them, but most. The hoodie is one for sure, and this sneaker is one. I play yo-yo too, that yo-yo beside the sneakers if produced by one my my friend, Hiroyuki Suzuki, founder of Freshthings, and a multi-time world yo-yo champion. He's produce some really great stuff.